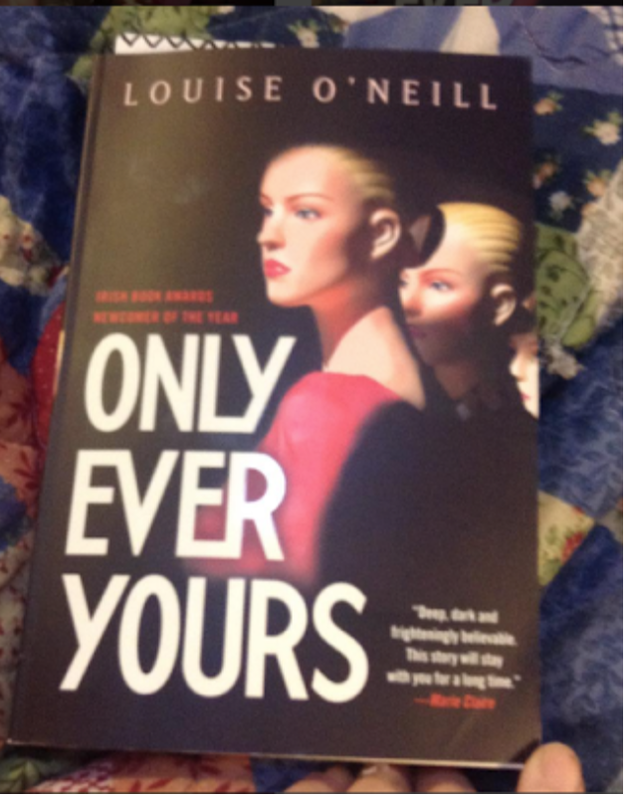 Only Ever Yours was a book I set out to read because I had heard such wonderful things about the writing and how it was written about feminism. I also want to broaden my horizons, when it came to books because most of my life I had read cute romance novels. You know those romance novels you pick up in the drugstore for about eight bucks and they are always the same. The girl usually is new to town, meets the local whatever it may be, i.e. doctor, sheriff, ranch owner and they fall for each other. But the guy is not really sure, so they break up and then he realizes he can't live without her.. ya da ya da, well this is not that kind of story. This story is about the perfect utopia world that really is more of a dystopian world. The main character is Frieda or number #630( reminds you of another time that numbers were used to describe people). Well, Frieda comes from a perfect society where Rich men rule and Women are only ever used for baby making or for being a concubine( 17th-century history, insert here). All women are taught that all they want is to be the wives. Sadly as I read this book I could never figure out if the women were robots or real. If you choose to read the book you will see what I am talking about, it's almost Stepford wife-ish. As the book continues I believe you will see what I saw and that is how much our world is like this book. How society ideas are put forth even today, i.e. How even now a woman is considered happier and wiser if she becomes a parent when she gets married, instead of being single or living independently. This book reminded me of the Hunger Games Series, in the way it describes the world and how history can be seen in it. Now I must warn you as I read this book it was unbelievably painful. I felt a mixture of emotions for what Frieda was facing while learning how to agree with her dystopian society standards. I finally realize the emotions were coming because I have seen these standards, maybe not as extreme as present in this book but I have seen these standards among society today. I have seen how women are taught that your life will be one hundred percent happier if you're married and have a kid. How by doing those simple things, you will contribute to the world better. To be honest I don't believe society knows that these things exist. Why? Because most of them have come in forms of traditions pass down among people. For example, if you decide to get married, it is modern day tradition that you get married in your early twenties. While for our great grandparents it was usually twenty for the men and fifteen or later for the women. After the marriage, then almost everyone around you, is saying, well when will you be having a baby, because most of history says that's how it all works. Even I did it earlier, when I started writing this article, I reference old age romance stories. In fact, since reading this book, I have discovered numerous things I do simply because of old traditions from society. This book made me understand so many things I do, even though it hurt like heck. I am always told the things that hurt you the most usually help change you the most. I am hoping that this book has changed me in some way for the better. I think that even though this book was painful, it should be read by both men and women. It is a classic in the making, even more than Hunger Games. This book should be read in every junior high and high school as an assignment because it will change the world. I just wanted to say thank you for taking the time to read this review as always. In the end, I gave the book 4 out of 5 stars because there were a few things I didn't quite understand while reading the book. I do want to say if you suffered from some sort of depression, you might want to try and read this book a little bit at a time because it does change your emotions drastically at points of time but I believe it is worth it in the end. I will link the author social media information below as well as where you can buy the books. Please feel free to follow me on here or leave me a comment about any of my book reviews.